The holiday window for Joan Shepp. 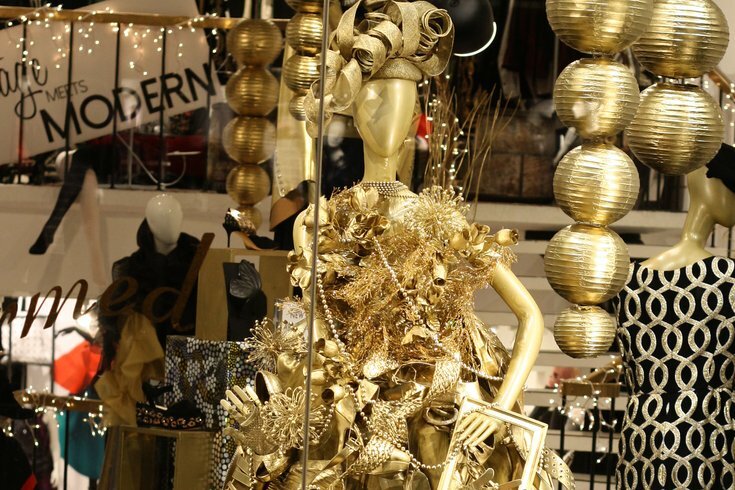 On Saturday, Dec. 9, the annual Rittenhouse Row Holiday Fashion Crawl will take place in the neighborhood. Participating shops will throw in-store parties with cocktails made by Rittenhouse bartenders, discounts, trunk shows, gifts with purchase and DJs, from 1 to 4 p.m.
A map of where to go will become available online here, the week-of the event. DFTI Boutique – 2026 Chestnut St.
ellelauri – 114 S. 19th St.
Govberg Jewelers: 1521 Walnut St.
Hope Chest: 1937 Chestnut St.
Joan Shepp: 1811 Chestnut St.
NINObrand: 333 S. 20th St.
Shop Sixty Five: 128 S. 17th St. Skirt: 212 S. 17th St.
SoulCycle: 113 S. 16th St.
South Moon Under: 1731 Chestnut St.
Look for bartenders from a.kitchen, Alma de Cuba, Bar Bombon, Coda, The Continental Midtown, Lou Bird’s, Ranstead Room, Rouge, Sip-n-Glo and XIX. Also, if you show your event map at Capital One, located at 135 S. 17th St., you'll get a complimentary handcrafted beverage. Once you’ve finished with the Fashion Crawl, stop by Alma de Cuba for the official event happy hour. There will be drink specials until 5 p.m.